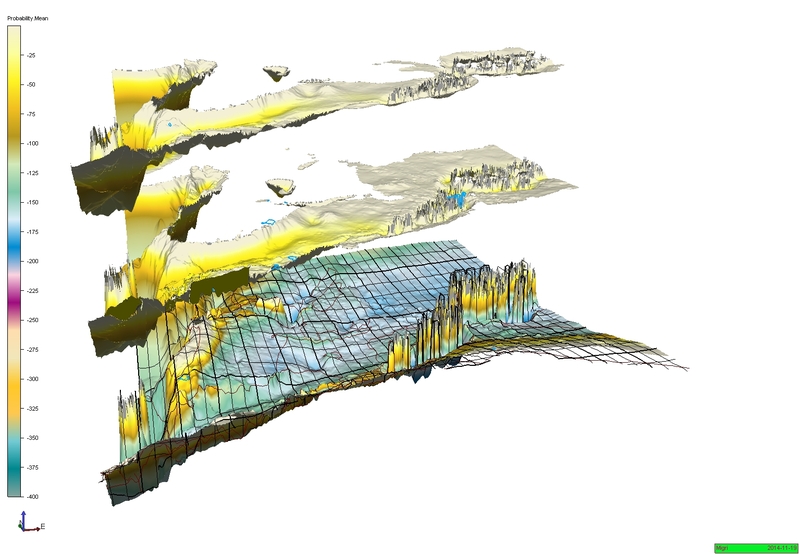 Migri is a “next generation 3D hydrocarbon migration simulator” which enables the evaluations of multiple alternative scenarios and sensitivities. 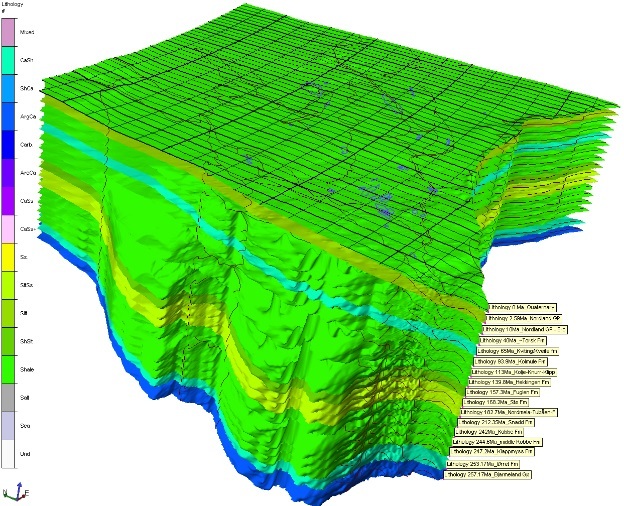 Burial, maturation, generation, migration, and leakage are dynamically modelled through time in each scenario for a full 3-D basin model with 15 stratigraphic layers. Onset time of HC generation (Ma). In this study probabilistic approaches have been applied in the numeric description of the source rock models (Cretaceous, Jurassic, Triassic and Permian source rock units, in figure below), in the thermal history, hydrocarbon generation, migration and leakage modelling. A database of 90 wells has been used for the construction of the source rock model and maturity model calibration. 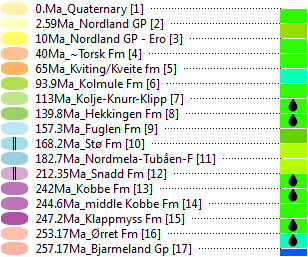 A high-resolution OF-Mod source-rock model for Hekkingen in the Hammerfest Basin is included. All hydrocarbon migration models were calibrated to existing discoveries in the area, and best-fit “base case” models have been deduced. Geological layer model with lithologies. Model sensitivities and key uncertainties are investigated through a Monte Carlo simulation technique and alternative migration and filling scenarios are presented. All key results are available as digital maps and compiled report documents. The results from the sensitivity analysis and probabilistic basin modeling work is available at a lateral resolution of 800 m. Results from the “base case” migration model runs are available at 400m lateral resolution. yellow-red=gas, right) are important results from the project. 1. Geological model building and calibration data compilation. 2. 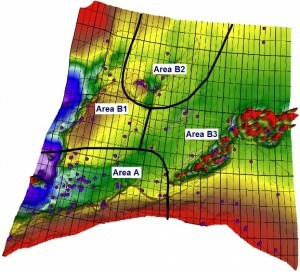 Calibration of hydrocarbon maturities and creation of generation histories. 3. Calibration of migration scenarios that can explain fields and discoveries. 4. Uncertainty investigations with elaboration of alternative migration scenarios in different areas. Study area with location of well data. Reporting will show the results for displayed AOI, which is subdivided into areas A, B1, B2 and B3. A report will be delivered in digital format (PDF/Microsoft Word/PowerPoint documents and some 3D animations). The final report highlights the methodology employed in each of the four work tasks. Important results are exported as grid files and included as project deliverables. Project results are offered for purchase from December 2014 onwards.